The starting point of the exhibition Confronting Comfort’s Continent* is the base of the foundation La Fabbrica del Cioccolato: a former factory. The discussion that ensues is about factories under workers’ control, where not only goods but also new social and economic models are “produced”. 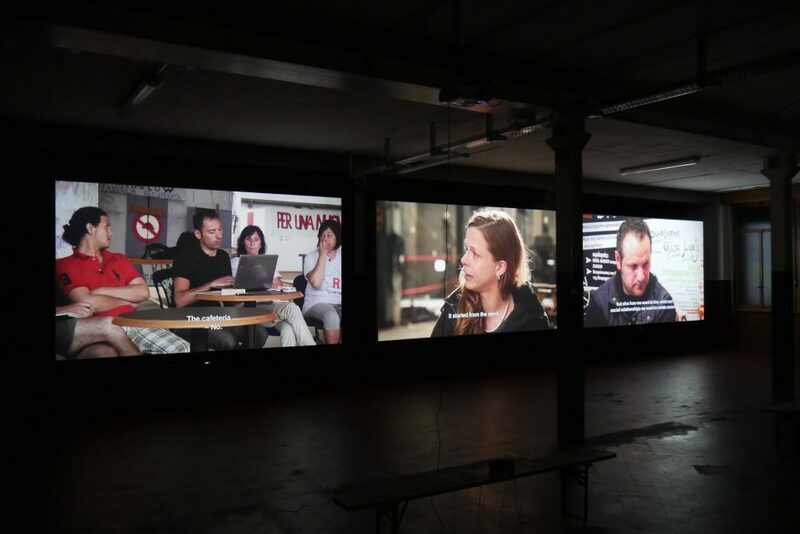 The 3-channel video installation Occupy, Resist, Produce (2014/2015; with Dario Azzellini) focuses on three factories in Milan, Rome and Thessaloniki, where the purpose of factory occupations was to bring production under workers’ control. 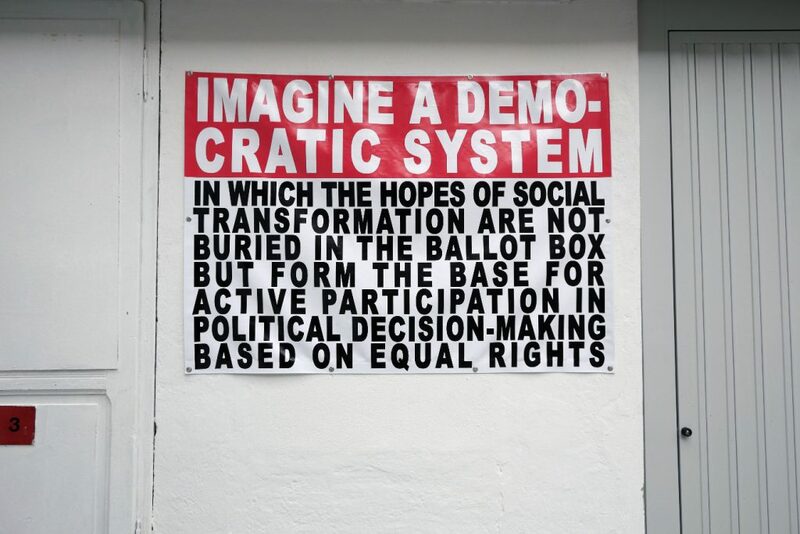 The workers take the initiative and become protagonists, building horizontal social relations on the production sites and adopting mechanisms of direct democracy and collective decision-making. The recuperated workplaces often reinvent themselves, building links with local communities and social movements. Millions of people were inspired by the attempt to produce new social models in the reclaiming of public space associated with the movements of the squares and the Occupy movement of 2011/2012. These non-hierarchical movements rejected representation: as in the recuperated factories, the activity was shaped by direct democracy. The occupation of public places served as a catalyst for demonstrations, broad-based strikes, meetings and working groups on urgent questions of all kinds. 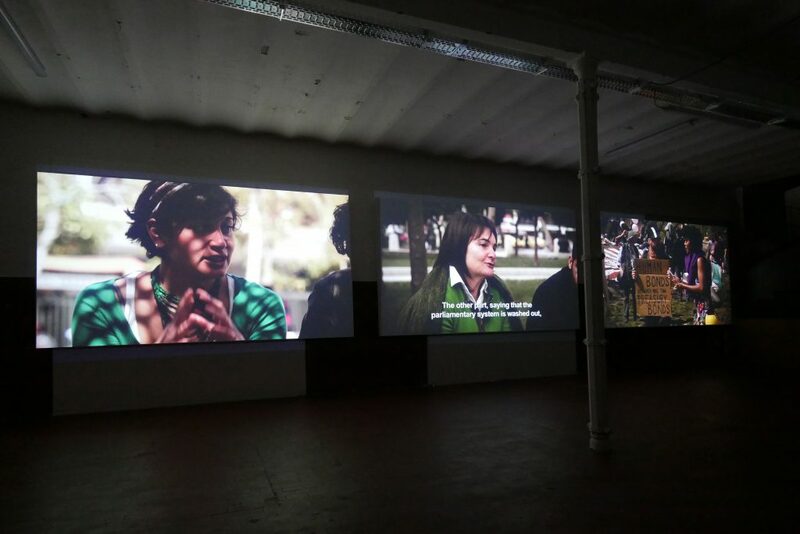 The 3-channel video installation Take The Square (2012) is based on discussions with activists from 15M in Madrid, the Syntagma Square movement in Athens and Occupy Wall Street in New York. The discussions cover issues of organization, horizontal decision-making processes, the importance and function of occupying public spaces and how social change can occur. 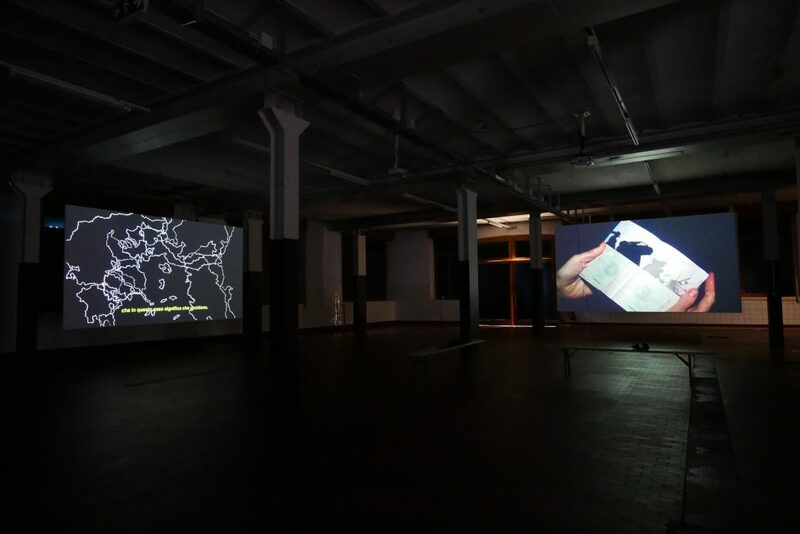 The exhibition of these two large 3-channel video installations is extended on another floor of La Fabbrica del Cioccolato, where four films are presented in dialog with digital prints and light boxes. The Visible and The Invisible (2014) and The Right of Passage (with Zanny Begg, 2013) are two films taking different approaches to cross-border movement, access (denied) and systematic plunder. The first looks at Switzerland’s role as global headquarters for barely visible transnational corporations trading in raw materials (“commodities”) extracted primarily from the southern hemisphere. The Right of Passage focuses on struggles to obtain citizenship while also questioning the inherently exclusive nature of citizenship. Interviews with Sandro Mezzadra, Antonio Negri and Ariella Azoulay open a discussion with a group of people living “without papers” in Barcelona. This discussion on borders is continued in Oliver Ressler’s most recent film Emergency Turned Upside-Down (2016). This film confronts the cynical and inhuman discourse that calls refugees’ presence in Europe “emergency” when that word should be applied to the war, terror and economic strangulation that forced people to move. The film is set within the tension that runs through social life right now: on one hand the vast imaginative potential of a border-less world, and on the other the petty prison of nationality and all the external, internal and social borders it entails. Leave It in the Ground (2013) extends to a global context the ecological perspective already present in Occupy, Resist, Produce, addressing the inflammatory effects of global warming on existing social conflicts. In the Global South, climate change aggravates crises of poverty, violence and unrest which – along with global warming itself – are legacies of colonialism and norms of neoliberal capitalism. This vicious circle fuels humanitarian crises and civil wars that amplify political, economic and environmental disasters. The film suggests that ecological and humanitarian disasters caused by global warming may topple old orders and open up possibilities of long-term social and political transformation, both positive and negative. The main idea of the exhibition Confronting Comfort’s Continent is to transform a (former) factory into a site for the production of knowledge and discussion of new social and economic models able to outrun the deadening capitalist realism on offer. * The title “Confronting Comfort’s Continent” is modified from the narration (co-written with Matthew Hyland) of the film “Emergency Turned Upside-Down”, where it refers to Europe in particular. But as a title it refers less to a geographical continent than to a kind of managed obliviousness to crisis, a condition sold as “comfort” by managers who find fewer willing buyers for it every day. Images: Oliver Ressler, Confronting Comfort’s Continent, 2016, Fondazione La Fabbrica del Cioccolato. Courtesy of the artist. Ressler is the first price winner of the newly established Prix Thun for Art and Ethics Award in 2016.